Portland, ME (May 9, 2016) – Foundation Brewing Company in Portland, ME will be growing at the current location on One Industrial Way starting this month with the expansion into three additional spaces formerly occupied by Bissell Brothers Brewing. This expansion will bring Foundation’s current space to a total of 7,500 sq. ft. and give the brewery the opportunity to expand its tasting room space, install additional fermentation capacity, and expand its packaging capability. The new tasting room will be expanded in both size and hours. Behind the scenes growth will include creating more efficiencies in operation work spaces and the opportunity for additional growth in 2017. Joel Mahaffey, co-founder and Head Brewer, says he is looking forward to “expanding the fermentation capacity that will allow us to brew our popular beers more frequently. The expansion will give us the opportunity to bring out new brands that support our focus on using classic styles as the inspiration for brewing beers that push conventional boundaries.” The brewery operates a 15 bbl brewhouse and has a current fermentation capacity of 180 bbls. They release fresh cans of popular brands like Epiphany, their Maine IPA, and Wanderlust, a hoppy Farmhouse ale, about every three weeks. The brewery anticipates being able to increase the frequency of their canning operations with the expansion. 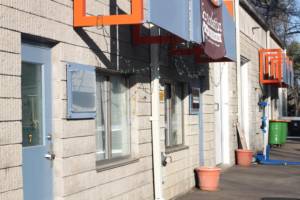 One Industrial Way has been an incubator for many other successful breweries, including Rising Tide Brewing, Maine Beer Company and Bissell Brothers. Allagash Brewing Company is located across the street, and Austin Street Brewery, who started in 2014 as well, is located on the opposite side of the One Industrial Way building. Along with their neighbors on the other side of the Park, Geary’s Brewing and New England Distilling, the Industrial Park has become a mecca for beer tourists visiting the Portland area as well as a fun place for locals to enjoy Portland’s exciting craft beer scene. Foundation will be updating its supporters as the building phase begins through social media channels and its website, www.foundationbrew.com. The brewery anticipates being able to open its new tasting room early to mid summer, and is not planning any significant tasting room closures during the construction. Founded in 2012 by Joel & Christie Mahaffey and John & Tina Bonney, Foundation opened in 2014 at One Industrial Way in Portland, Maine. They use classic styles as the inspiration for brewing exciting beers that push conventional boundaries. Foundation is well known for their Maine IPA, Epiphany, a double IPA dry hopped with Mosaic, Citra and Ella hops and designed to showcase the glorious flavor and aromatics of hops without any astringent bitterness. Other popular beers include Afterglow (an American IPA), Wanderlust (a Hoppy Farmhouse Ale), Burnside (a Brown Ale), Eddy (a Saison), Blaze (a Farmhouse IPA), and Forge (a Russian Imperial Stout). Foundation distributes throughout Maine with Mariner Beverages, and to limited areas in Massachusetts and Vermont. Learn more at www.foundationbrew.com or on Twitter/Instagram/Facebook @foundationbrew.